The brain contains more than 1011 neurons, each of which forms and receives many synapses - from a few hundred to more than 100,000. Neurons fall into different types and subtypes that are defined by a characteristic pattern of synaptic connectivity. Here, the 'pattern of synaptic connectivity' refers to which downstream target neurons a neuron forms synaptic contacts with, and which upstream neurons in turn form synapses on a particular neuron. Moreover, the pattern of synaptic connectivity that is characteristic for a given type of neuron includes the properties of these synaptic contacts (location on the target neurons, properties of synaptic transmission). For a given type of neuron, the pattern of synaptic connectivity is very reproducible from one neuron to the next; moreover, for a given type of neuron the average number of inputs and outputs is always the same, i.e., there are no "better" or "worse" neurons in terms of how connected a neuron is. A good example of these basic synaptic circuit principles is the CA1 region of the hippocampus, one of the best studied brain areas (reviewed in ref. 1; see Figure 0.1; Colorplate 1). The CA1 region contains an apparently homogeneous set of excitatory pyramidal neurons that are arranged in a single layer (stratum pyramidale), and that elaborate extensive apical and basal dendrites. CA1-region pyramidal neurons receive five different types of excitatory inputs: In addition to axon collaterals from the CA1-region pyramidal neurons themselves, these inputs are derived from CA3-region pyramidal neurons, and from entorhinal, amygdala, and thalamic inputs. 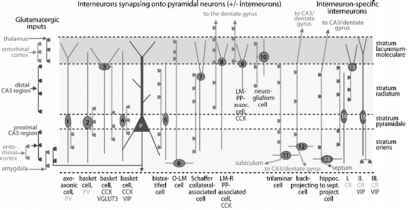 Furthermore, the pyramidal neurons receive inhibitory inputs from at least 12 types of local interneurons. Finally, four additional types of interneurons in the CA1 region only synapse onto other interneurons. The complex excitatory and inhibitory inputs onto CA1-region pyramidal neurons are precisely targeted to restricted parts of the pyramidal neurons - nothing appears to be left to chance. The inputs from CA3-region pyramidal neurons that are closest to the CA1 region innervate only dendrites in the stratum oriens, whereas inputs from CA3-region pyramidal neurons that are further away from the CA1 region innervate only dendrites in the stratum radiatum. Thalamic inputs, in contrast, are restricted to stratum lacunosum-moleculare dendrites, while axon collateral inputs from the CA1-region pyramidal neurons and inputs from the amygdala are only made on dendrites of the distal stratum oriens (Figure 0.1). The inputs from the different types of interneurons exhibit a similar laminar-specific innervation pattern on pyramidal neurons, and these inhibitory neurons themselves in turn receive spatially well-organized inputs from excitatory and inhibitory neurons that are also differentially formed on the soma or dendrites of the interneurons. This pattern of synaptic connectivity in the hippocampal CA1 region, exemplary for many other brain regions, results in a vast neural network that would already be enormously complex if only two types of synapses existed (excitatory and inhibitory). However, an additional element of complexity is generated by characteristic differences in synaptic transmission at synapses between defined types of neurons. Thus not only the number and location of synapses are characteristic of synaptic connections formed between two types of neurons, but also the properties of these synapses (e.g., whether they are facilitating or depressing, exhibit NMDA-receptor dependent plasticity or other forms of synaptic plasticity, and so on). Figure 0.1. Schematic Diagram of the Innervation Patterns of a Pyramidal Cell in the CA1 Region of the Hippocampus by 12 Types of GABAergic Interneurons. The main laminar-specific glutamatergic inputs are indicated on the left. The somata and dendrites of interneurons innervating pyramidal cells (green) are shown in orange, those innervating mainly or exclusively other interneurons are shown in lilac (see Colorplate 1). The main termination zones of GABAergic synapses are shown by trapeziform symbols. The proposed names of neurons, some of them abbreviated, are under each schematic cell and a minimal list of molecular cell markers is given, which in combination with the axonal patterns help the recognition and characterization of each class. Note that one molecular cell marker may be expressed by several distinct cell types. The number of interneurons shown is not exhaustive or complete. Note the association of the output synapses of different sets of cell types with the perisomatic region, and either the Schaffer collateral, commissural, or the entorhinal pathway termination zones, respectively. 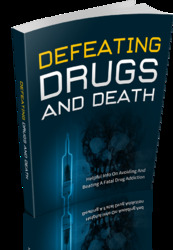 CB, calbindin; CR, calretinin; LM-PP, lacunosum-moleculare-perforant path; LM-R-PP; lacunosum-moleculare-radiatum-perforant path; m2, muscarinic-receptor type 2; NPY, neuropeptide tyrosine; PV, parvalbumin; SM, somatostatin; VGLUT3, vesicular glutamate transporter 3. Modified with permission from ref. 1. Synapses formed by a single neuron onto different target neurons can have dramatic differences in properties, depending on the target neuron with which these synapses are formed. A well-studied example for such differences is the synapses formed by pyramidal neurons in layer 2/3 of the cortex. Among others, these pyramidal neurons form synapses onto two types of interneurons, bitufted and multipolar neurons, with very different properties2 (Figure 0.2). The synaptic properties suggest a large difference in presynaptic release probability; as a result, the pyramidal synapses on bitufted interneurons are very ineffective but facilitating, whereas the synapses on multipolar interneurons are reliable but depressing. These differences corresponded to differences in Ca2+-influx3. The differences between presynaptic release from terminals formed by the same presynaptic neuron onto different postsynaptic neurons suggest that the post-synaptic target neuron instructs the presynaptic neuron what kind of synapse to form, indicative of a retrograde trans-synaptic signaling process. These examples illustrate that the specificity of connectivity in synaptic networks not only consists of the specificity of neuronal synaptic partners (i.e., the question of which neurons communicate with each other pre- and postsynaptically), but also of the specificity of where on these neurons synapses are formed, and what functional properties these synapses have. Understanding these three facets of synaptic connectivity is of central importance for understanding the wiring diagram of the brain. Thus, the problem of synapse formation not only consists of the question of how each individual neuron receives specific inputs from a series of neurons, and forms specific outputs onto another series of neurons. In fact, phrasing this question in this manner is misleading because there is little evidence that there is point-to-point specificity; rather, the evidence suggests that there is class-to-class specificity, with neurons of class A on average forming X numbers of synapses with neurons of class B. This means that as long as classes of neurons have mechanisms of finding each other and achieving an average number of connections, there is no need for a precise blueprint of connectivity. Based on this consideration, understanding synaptic connectivity requires insight into a fourth facet of neural network formation, namely the mechanism that ensures that a neuron forms the same average number of connections with a given class of target neuron. The assumption that connectivity is based on random connections between classes of neurons simplifies any mechanism, and suggests a plausible explanation for the massive amount of synapse elimination that occurs during development4. According to this hypothesis, synapses form between classes of neurons, and are then 'averaged' out, possibly in an activity-dependent manner, so that the correct average connectivity is achieved. Figure 0.2. 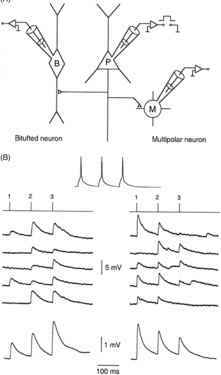 Synapses Formed by a Pyramidal Neuron (P) of Layer 2/3 in the Cortex with Two Different Types of Interneurons, Bitufted (B) and Multipolar neurons (M), Exhibit Distinct Release Properties. (A) Schematic drawing of the recording configuration used for the traces shown in (B). 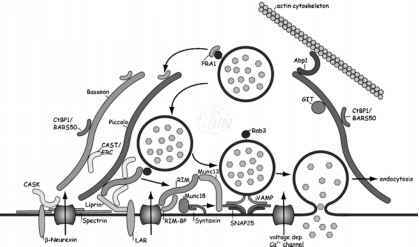 The presynaptic pyramidal neuron was stimulated by brief intracellular current injections, and unitary EPSPs were recorded simultaneously from a bitufted and a multipolar postsynaptic interneuron. (B) Representative traces of five consecutive EPSPs recorded in bitufted and multipolar interneurons. The numbers above the records indicate the time of presynaptic action potentials. The lowermost traces represent averages of 100 sweeps. The efficacy of unitary EPSPs, measured as their amplitude, was 0.92 ± 0.49 and 3.3 ± 1.9 mV for bitufted and multipolar interneurons, respectively; the reliability, measured as the failure rate, was 42 ± 18% and 1.6 ± 3.5% for bitufted and multipolar interneurons; the mean paired pulse ratios were 1.95 ± 0.59 and 0.53 ±0.12 for bitufted and multipolar interneurons, respectively; and the mean EPSP latency was 2.97 ± 0.42 and 1.17 ± 0.19 for bitufted and multipolar inter-neurons, respectively. Reproduced with permission from ref. 2.